Sometimes necessity produces meals that are merely edible. These meals might be filling and nourishing, but in the end, they are (mercifully) not terribly memorable. 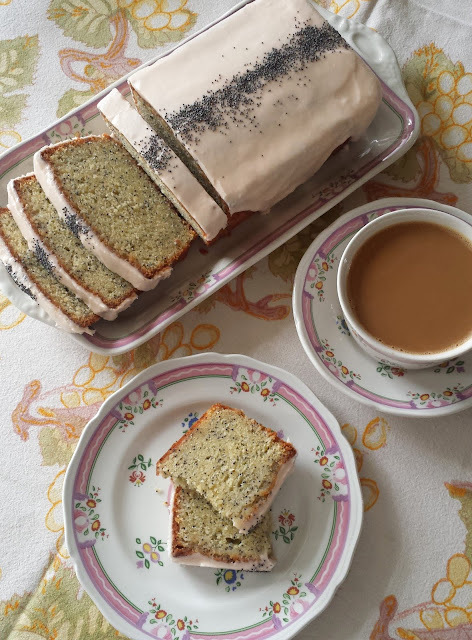 On the other hand, there are those—hopefully more frequent—occasions when the odds and ends of a pantry come together in such a way that a new favorite is born. Such was the case for me when I recently found myself with a large quantity of beet greens in my produce bin. These particular beet greens were especially beautiful. To me this seemed unusual for this time of year—I noticed them when I purchased the beets (which also happened to be pretty nice). Since the greens were so lovely, I was determined to use them before they lost their freshness. With this in mind, I gave them a prominent place in my produce drawer where they would announce their presence to me every time I opened the drawer. I am pleased to report that it worked. 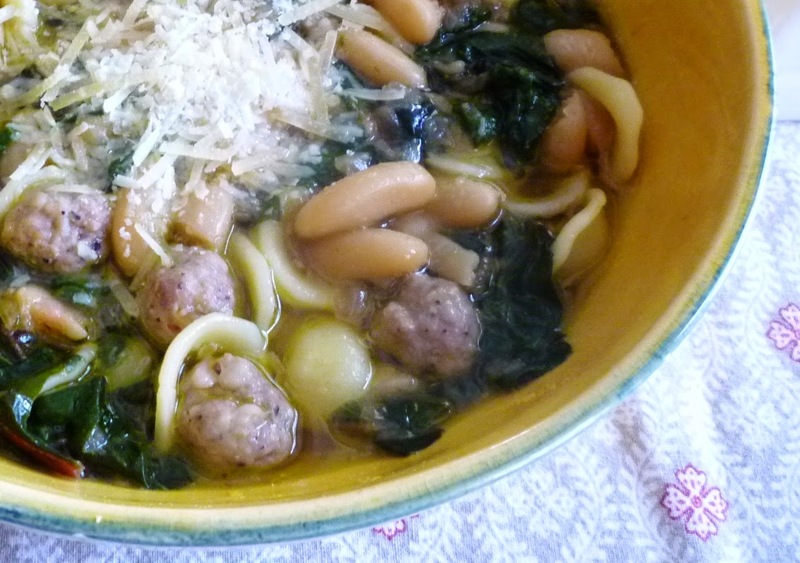 When I finally used them, I combined them with some Cannellini beans and Italian Sausage in a simple broth-based dish. The dish was light—but wholly satisfying—and it was entirely composed of things I happened to have on hand. I only used a small handful of beans—mostly because that was all that was left in the bottom of the bag, but also because the dish I had in my mind was more broth-y than bean soup-like. 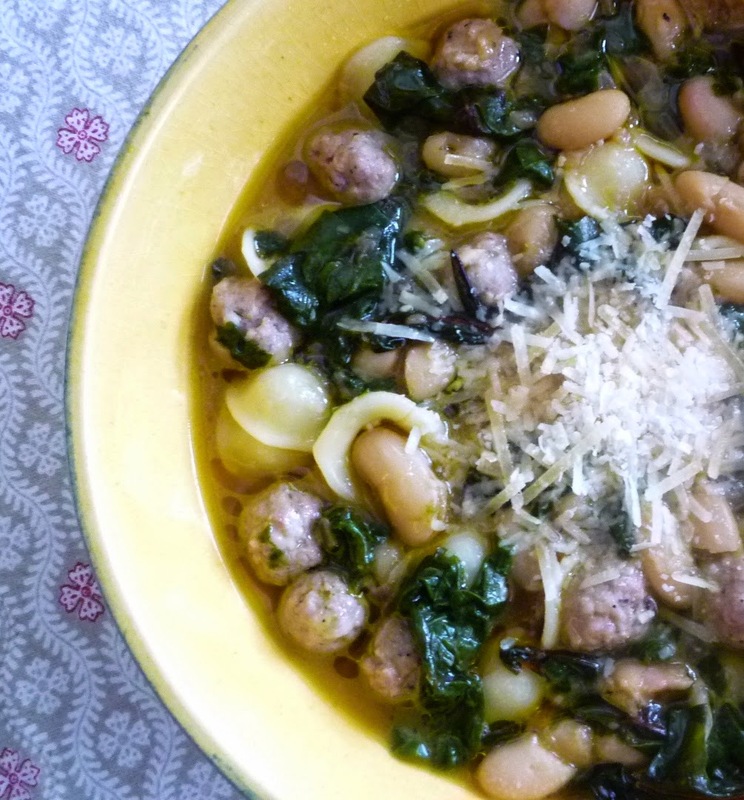 The Italian Sausage is something I always keep in my freezer…and it is delicious with beans and greens. Finally—in order to create a dish with a bit more substance—to the greens, beans and sausage, I added some orecchiette pasta (just a small amount…I wasn’t trying to make a “pasta” dish). Instead of browning the sausage links and dicing or slicing them….or crumbling the sausage up and browning it….I decided to form the sausage meat into tiny little balls and drop these into the simmering broth at the very end of the cooking time. 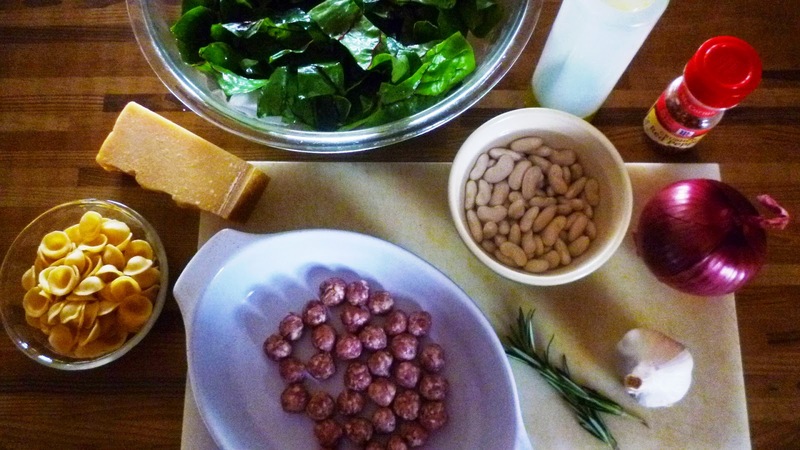 The sausage remains soft, juicy and tender this way, but best of all, the little balls gave the humble bowl of beans and greens a whimsical look and an out of the ordinary air….far beyond the amount of work required to make them. To form them, simply dampen your hands, pinch off a small piece of the sausage meat (casings removed if you purchase links) and then with slightly damp palms, roll the bit of sausage into a ball. Remember to keep them small…a half pound of sausage should yield about 64. When they are this small, they will cook quickly, match the size of the cannellini beans and nestle neatly into the cup shaped orecchiette. If you have homemade stock in your freezer, this dish would be a great place to use some. The broth figures prominently in the flavor of the final dish, and while I am not opposed to using good canned broths, there are times when using a nice homemade stock is worth it. I think this is one of those times. The bean cooking liquid too adds a lot of flavor to this dish…flavor you will miss if you use canned beans. So, if you can, plan ahead and soak the beans overnight….or quick soak them as I describe another “beans and greens” dish post. I’m sure the final dish will taste fine if made with canned beans and canned broth….but it will most likely lack the special quality of a dish made with homemade broth and dried beans. As I mentioned at the first, this dish came about because of the beet greens I already had on hand. Normally, beet greens are not something I purchase….I only have them if I have had a need for some beets. Since I am far more likely to purchase Swiss Chard, I made this dish a second time with Swiss Chard. I am happy to report that it is delicious with the chard. 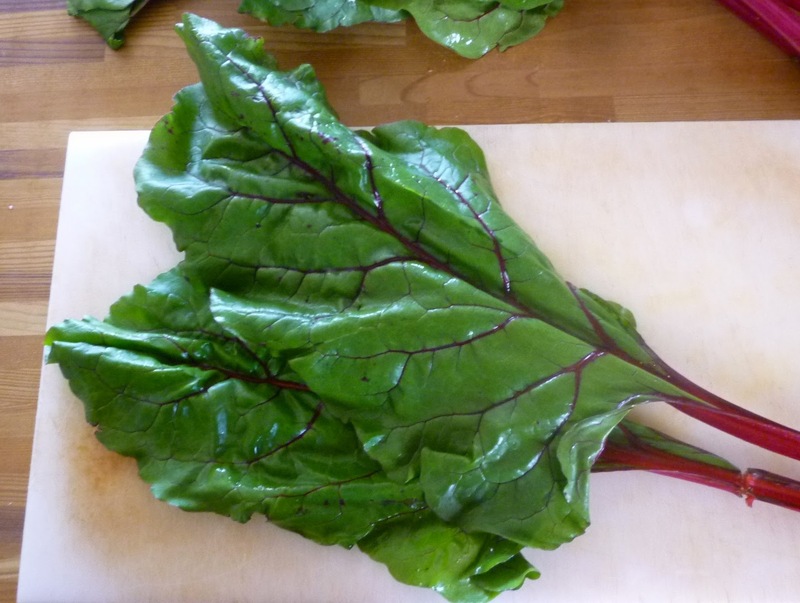 I think it is better with the beet greens—they seem to have more substance than the chard and also a bit more flavor—but still, it was very good…definitely worth making. In fact, I imagine you could make this dish with any green you liked, as long as you cook them in a way (and for a length of time) that is appropriate for your chosen green. As for me though, I think I will tuck this recipe away as one of my favorite ways to use beet greens. I may even make a point of finding a reason to purchase beets whenever I happen to see a few bunches with especially fine greens…just so I will be able to have this dish. Drain and rinse the beans and place in a small sauce pan. Add enough cold water to cover by a couple of inches. Add a couple of cloves of garlic and a sprig or two of rosemary. Bring to a boil and skim off any foam that comes to the surface. Add a generous drizzle of olive oil, reduce the heat. Maintain a gentle simmer, stirring occasionally, until the beans are very tender…about an hour to an hour and a half. When the beans are half cooked, season to taste with salt. Add hot water to the pan as necessary to maintain enough liquid to cover the beans by a half inch to an inch. When the beans are cooked, remove the garlic cloves and the rosemary. Set the beans aside (leave them in the cooking liquid) until ready to add them to the final dish. You may cook the beans a day or so ahead if you like. Cool and store the beans in their cooking liquid. Warm about 3 tablespoons of olive oil in a large, wide sauté pan with straight sides or a Dutch oven set over medium heat. Add the red onion, along with a pinch of salt, and sweat until very tender and beginning to caramelize, reducing the heat if the onions begin to color before they are tender—about 10 to 15 minutes. While the onions cook, mince two or three cloves of garlic. When the onions are ready, add the garlic and pepper flakes and continue to cook until fragrant…a minute or two. Add the greens to the pan (along with any water clinging to them) a handful at a time, turning with tongs to coat in the oil, and adding another handful as the previous one begins to collapse. Season with salt (be careful—the sausage will be salty and the greens will continue to collapse) and continue to cook until the greens are just tender. While the greens cook, bring a large pot of water to the boil. Salt the water generously (about a teaspoon per quart). Drop the orecchiette into the boiling salted water and cook until al dente. Drain, toss with a bit of olive oil and set aside in a warm spot. When the greens are tender, add the chicken stock along with the beans and their cooking liquid. Bring the broth to a simmer. Add the meatballs to the simmering liquid. Continue to simmer until the meatballs are just cooked through…about five to seven minutes (cut one open to make sure it is cooked through). Taste the broth and adjust the seasoning. Divide the warm pasta among warmed shallow soup bowls. Divide the beans, greens, sausage and broth among the bowls. Drizzle with olive oil if you like and top with freshly grated parmesan. Serve immediately….with crusty bread, biscuits or cornbread. Serves 4 to 6, depending on appetites. I would use kale as the green and I really like your mini meatballs. I also like to keep my pasta separate in a soup like this so it doesn't soak up all the broth over time. Nice winter recipe! Thank you, Judy! I think kale would be delicious, too.